After four straight double-digit win seasons, Stanford football will be on the wrong side of the 10-win mark – and possibly by a wide margin – for the first time since 2009. We asked football writers Joseph Beyda, Vihan Lakshman and David Cohn: Will Stanford’s dip in performance this season have a profound impact on recruiting? David: While the Cardinal will not represent the Pac-12 North in the Pac-12 Championship Game for the first time in three years, the foundations of the program remain strong, so I do not expect this season to have a profound impact on recruiting. This is because the Card continue to develop players at its historically strong positions. In particular, the emergence of the three sophomore tight ends in Greg Taboada, Austin Hooper and Eric Cotton in their first seasons on the field will mean that the Farm will continue to be Tight End U. While the offensive line, as a unit, has had an up-and-down season on the field, the Card’s placement of David Yankey, Cameron Fleming, David DeCastro, Jonathan Martin and others in the NFL, as well as the development of Andrus Peat into a Day 1 NFL draft prospect, will still hold weight with the best offensive line recruits in the nation. 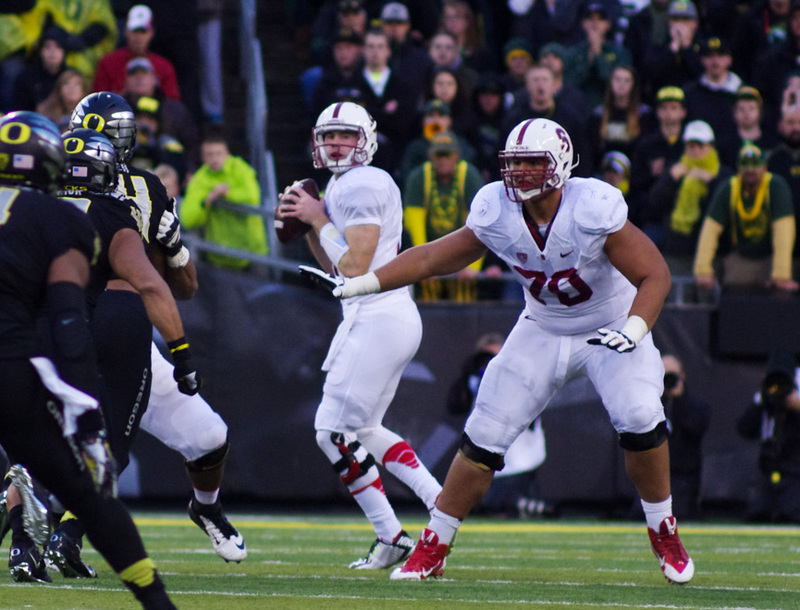 Stanford already has two four star commitments on the offensive line for 2015 in recruits Brian Chaffin and Nick Wilson, and I imagine that the Card will continue to be active and successful in recruiting offensive linemen to the Farm. I could go through the other position groups one-by-one, but I think that the takeaway message in recruiting for Stanford is development. More specifically, the Cardinal program continues to be successful in developing its players, helping them improve toward achieving their professional goals both in the NFL and outside of football. As long as those two facts hold true, Stanford will continue to recruit at a high level, namely because of its preeminent position as one of the best academic institutions in the world, with four BCS Bowl appearances, two Pac-12 titles, and with one more win, six straight bowl berths in recent years. Joseph: I’m not quite as optimistic as David. Bumps in the road — whether a bad season, a change in coaching staffs or NCAA sanctions — threaten recruiting for basically every program in the nation, save for the USCs and SEC powers of the world. Stanford has certainly established staying power with recruits over the last five years or so, but this mind-boggling season is bound to test that success at least somewhat. Now, in the long run, there are a lot of things for Stanford to feel good about on the recruiting trail. Slips by other football programs at strong academic schools (Vanderbilt, Northwestern, UCLA) this season still make the Farm a very competitive option for elite athletes who are interested in getting a great education. The Cardinal also continued to recruit at a very high level after the transition from Jim Harbaugh to the then-first-time head coach David Shaw, perhaps indicating that their target audience isn’t as fickle as the average high school senior. In the next class or two, however, we shouldn’t be surprised if there’s a dip. Just imagine a recruit choosing between Stanford and ASU, or Stanford and Oregon, who took an official visit to Tempe or Eugene the weekend the Cardinal were run out of town. 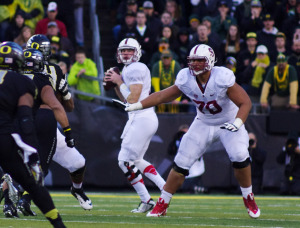 Watching those games, any recruit’s faith in Stanford would be shaken. Vihan: Ben Gardner, two-star recruit. Doug Baldwin, two-star recruit. Chase Thomas, three-star recruit. Zach Ertz and Coby Fleener, three star recruits. Trent Murphy, three-star recruit. And the list goes on and on. Stanford didn’t rise to the upper echelons of college football by waking up one day and suddenly hauling in truckloads of blue-chip prospects. Jim Harbaugh, David Shaw and the rest of the coaching staff identified smart, underrated players with chips on their shoulders and watched them develop into NFL talent. Recruiting is absolutely crucial — there is no doubt about that. Stanford definitely wouldn’t be the same without the likes of touted prospects like Andrew Luck, Ty Montgomery or Andrus Peat, but there is a reason we don’t hand out championship trophies on National Signing Day. This season was supposed to be the year that Stanford’s record-setting 2012 recruiting class seized the spotlight, but success hasn’t really materialized the way some envisioned. Will Stanford’s recent struggles lead to a dip in recruiting? I think that’s a certainty, but it won’t be the end of the world. It certainly wasn’t just a few years ago. The fact is that Stanford can win football games by finding players who fit the program’s mentality. It’s never easy, but the Stanford coaching staffs of the late 2000s could recruit and develop current NFL talent despite mediocre records. Joey makes a great point about Stanford recruiting targets losing faith after watching a couple of those rough road performances. I don’t think it’s a coincidence that Canton Kaumatule (brother of Luke) committed to Oregon a day after his official visit to Eugene, when he watched the Ducks crush Stanford at Autzen Stadium. Bad losses will hurt, sometimes for a long time. Overall, though, I feel pretty optimistic about Stanford’s recruiting future. The Cardinal’s recent success should still entice many of the nation’s top recruits, and the coaching staff has shown a knack for finding the next Gardners, Murphys and Baldwins, underrated players with winning attitudes. That’s what Stanford recruiting has really been about. With the this less than stellar state of Stanford football, The Stanford Daily’s football writers have no choice but to either be optimistic towards the future or to berate the current team for its shortfalls. In this instance, optimism, has won. Share your optimistic v. pessimistic attitudes toward the team with David Cohn, Joseph Beyda and Vihan Lakshman at dmcohn ‘at’ stanford.edu, jbeyda ‘at’ stanford.edu and vihan ‘at’ stanford.edu.